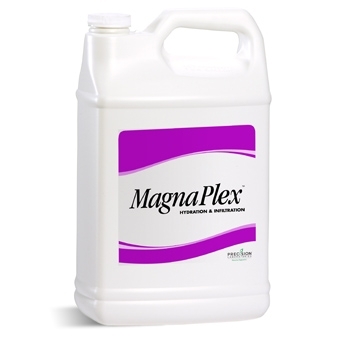 A blend of Magnus and Duplex at a 4 to 1 ratio, MagnaPlex combines the hydration of Magnus and the infiltration of Duplex in a convenient, easy-to-use formulation that does not require immediate post-application irrigation. Spray Application: Apply MAGNAPLEX at the rate of 5 ounces (148 ml) in a minimum of 1 gallon (3.79 L) of water per 1,000 square feet (92.9 m²) of turfgrass. Apply MAGNAPLEX at the rate of 220 ounces (6.51 L) in a minimum of 44 gallons (167 L) of water per acre (0.40 ha) of turfgrass. Injection: Apply 32 ounces (946 ml) in a water volume sufficient to treat one acre (.40 ha).